Get ready to soar to new heights with Disney’s Planes, which takes flight in theaters on August 9th, 2013. 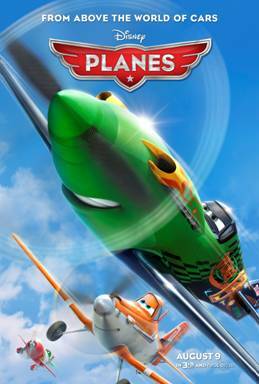 Planes is set in the same universe as Disney/Pixar’s Cars and Cars 2; if you are fans of either of those movies, you’ll absolutely love getting to know Dusty, Dottie, Skipper, Chug, and all of the other endearing characters that will make this a theater experience your whole family will love. Dusty Crophopper (Dane Cook) has dreams of becoming a competitive aerial racer. He has two things against him, though: he is a cropduster and he is afraid of heights. On and off the fields, Dusty daydreams about what it would be like to fly high and uninhibited. When Dusty learns about an aerial competition, he decides to enter and seeks out the help of Skipper (Stacy Keach), an intimidating former top instructor of a military squadron. At first Skipper turns Dusty away, but soon after he sees Dusty’s potential and agrees to help him. Against all odds (and with a little bit of luck), Dusty makes the cut for the world-famous aerial competition. Dusty’s good-natured personality is quite a contrast to some of his rivals—especially Ripslinger (Roger Craig Smith), who isn’t above bending the rules just to win. I’ve been following online discussions about Planes for a while now; most people were not sure what to expect since this was originally supposed to go directly to DVD and is not a Pixar film, but is set in the same world as Cars and Cars 2. There have been a lot of mixed feelings about this film, and now the world will decide if the film is a success or not. For me, it was a total hit! The elements of a good (or great) film for me are memorable characters, a healthy balance between humor and drama, and a positive message that can teach me something. Planes has everything I was looking for, and actually exceeded my expectations: I laughed, I shrank down in my seat at exciting moments, and I wanted nothing more than for Dusty’s biggest dream to come true. Planes featured characters with many different types of personalities. While Dusty may remind some people of Lightning McQueen, Dusty is likable from beginning to end, whereas it took me a while before I actually warmed up to McQueen. The same could be said of Skipper and Doc; I see more similarities between these two than I do of Dusty and Doc. Dottie (Teri Hatcher) is Dusty’s mechanic and helps to keep Dusty grounded; she is never afraid to tell him how things really are. But when she realizes just how much Dusty’s dream means to him, she does everything she can to support him and help him succeed. Planes is of course going to appeal to young children, especially ones who are already in love with the Cars characters, but there is more than enough adult humor peppered throughout the film to keep adults entertained as well. My favorite side stories involved El Chupacabra’s (Carlos Alazraqui) hilarious wooing of Rochelle (Julia Louis-Dreyfus) and Ishani’s (Priyanka Chopra) struggle with being true to herself and compromising her values to get what she wants. There are many lessons that can be learned from these lovable, hilarious, and adorable new additions to the Disney family. Dusty made me believe that I could do anything I wanted to do in my life if I have the courage to dream big and overcome any obstacles standing in my way. Dottie taught me that while I should be realistic, with a little bit of determination and support from others, dreams can come true. And Skipper taught me what is perhaps the most important lesson of all: learn from your mistakes and never be afraid to try again. Planes soars into theaters today, August 9th, 2013! Follow Planes on Twitter and Facebook to stay up-to-date on all the latest news. Asked my now 12 year old son if he wanted to see this – he just said that it kind of looked like a ripoff of Cars and wasn’t interested – ah they grow up fast. I cannot wait to see this. I was thinking about taking the 2 year-old rugrat but maybe he still too young? I sure hope you enjoyed the premiere! What an exciting experience. I plan to take my son to see this because it looks good to me. Disney movies don’t usually disappoint me. I’ve been hearing a lot about this new movie and plan to watch it, thanks! I can’t wait to see this with my grandkids! My husband and I love being able to take them to movies, because we enjoy them just as much as they do! Disney cars was great!! This seems as though it will live up to it. I am excited to see this movie and I am sure my little ones will be too. My son loves Cars. I think he will love this as well as he also is interested in toy planes. We are taking him to see it this weekend we can’t wait to see how he does, first time in a movie theatre. Thanks for the awesome review!! My sons loved Cars and I’m sure they will love this! What a great way to introduce kids to aviation and adventure. This is gonna be awesome! My 3 and 5 year old boys are so excited to see this movie. They saw the trailers and won’t stop talking about it so we’ll definitely be buying the movie as well. Big fan of Disney everything-can’t wait! Love the dream cast, especially Teri Hatcher and the Top Gun tie-in!